PENTAGON — The commander of U.S. and international forces in Afghanistan says the Trump administration’s strategy for the war-torn country is yielding progress, despite no significant changes on the battlefield and several deadly Taliban attacks. “I believe the strategy is working,” U.S. Army Gen. John Nicholson told reporters at the Pentagon via telephone. Last year, the Trump administration called for a conditions-based deployment of U.S. troops in support for Afghan forces. Nicholson said this approach on the battlefield “has affected the enemy’s calculus” and pushed them toward reconciliation. He said the Taliban now has the incentive to negotiate because the coalition has “clearly communicated” that they are not leaving, pointing to two peace offers and a cease-fire as evidence of the progress. Michael O’Hanlon, senior fellow in defense and foreign policy at the Brookings Institution, called Nicholson’s comments “the most optimistic interpretation of what’s possible” in Afghanistan. From 2017 to 2018, Taliban control of the Afghan population has grown slightly from 9 percent to 12 percent, with about a quarter of the population living in areas contested by the Taliban and the Afghan government, according to the latest data from the Special Inspector General for Afghanistan Reconstruction. 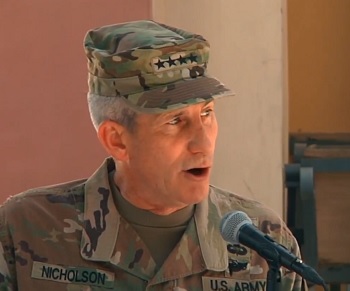 Nicholson said the lack of change with respect to the Afghan government’s population control has been predicated on what he called the Afghan military’s “works in progress,” namely the growth in the number of Afghan commandos and the growth in the Afghan air force. But the general also admitted that “traditional metrics of fighting are not explaining why the Taliban are willing to talk now,” suggesting instead that social and religious pressure is advancing the peace process. O’Hanlon cautioned that it will take many years before results from the new strategy could be measured. “I think stalemate is far and away the simplest, safest way to interpret the dynamics in Afghanistan,” he said.